Lose your marbles over this family friendly board game. You’re a senior at the Horribilorum Sorcery Academy for Witty Witches and Wizards and it’s time for your final test. Collect ingredients (marbles! ), create potions (with marbles! ), and drink those potions (no more marbles!). Earn more victory points than the other students and be hailed by all as Witch/Wizard valedictorian of your class. The gameplay is simple. On your turn, pluck a marble from one of the tracks in the ingredients tray and allow gravity to do its work. The marbles will slide down and collide. If the same colored marbles connect, it causes an explosion. Not an actual explosion, that would be dangerous, but a figurative one. You gain all the ingredients in that chain (the like-colored ones). Then place those on the matching ingredient spaces on a beaker. When you fill up the cardboard beaker, the potion is complete and you’ll score points for it at the end of the game. Each potion is tied to one of six spells. You can drink a potion (just once) to activate the spell. Most of these get you additional ingredients on a turn. If you finish five different types of spells, you earn a Skill Token (worth 4 victory points). Finish three of the same spell and you earn a Skill Token. When the pile of Skill Tokens are gone, the game ends. Count your victory points and that’s that. It’s a really simple game. But that doesn’t mean it’s a shallow game. Potion Explosion has some subtle strategy as you work to maximize combos of ingredient explosions. And decided when to drink your potions and activate specific spells. 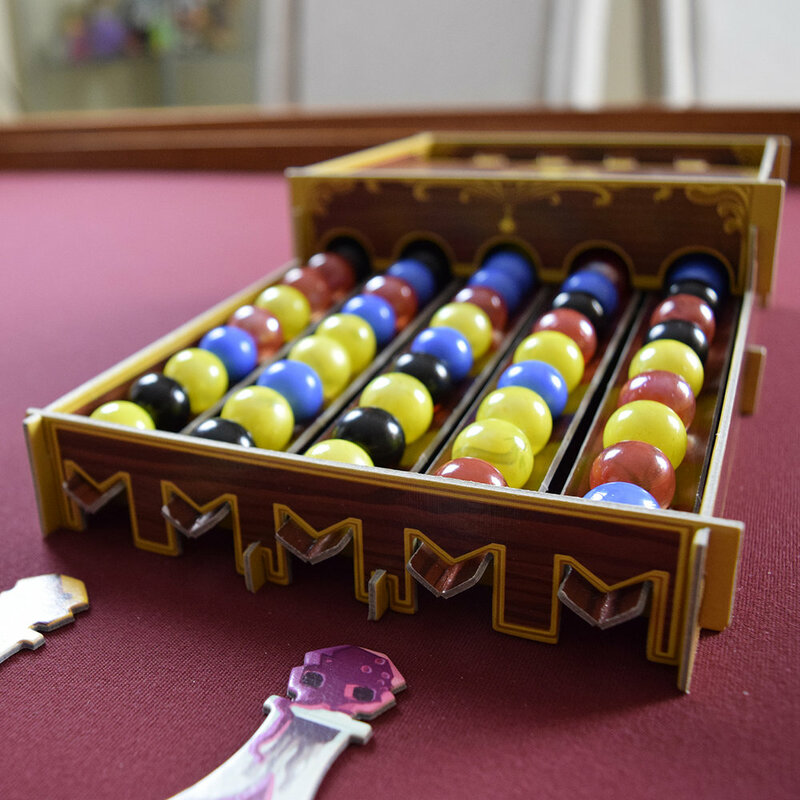 This is a fun game that is totally kid-appropriate, but will also satisfy the child in most. Marbles are a blast to play with and there’s a surprising jubilance in watching a trail of them slide down the track. 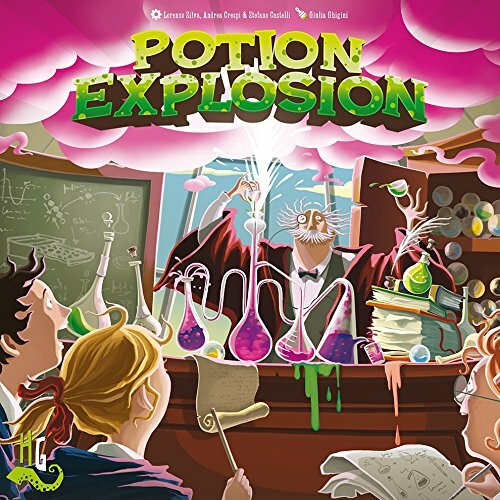 In an industry that often offers grim, complex, and visually dark games, Potion Explosion is a light, easy, and joyful experience. Good for all ages (and that doesn’t mean it’s too kiddy for adults). The contraption for holding all those marbles is a little cheap-looking compared to the rest of the components. Not enough variety in the spells. Can almost end too quickly. You want a break from heavier, grimmer games. Fun is more important to you than deep strategy.